The ultimate sophisticated name of high capacity Inverter /UPS from TP Impex Limited packed with the solution of DSP based technology in Single Phase Input- Single Phase Output & Three phases Input - Three Phase Output. This state-of-the-art technological marvel gives you continuous comfort. One Stop Shop Solution: Hulk sine wave series is one stop shop solution for Cold Start, Pollution Free, and Sound Free environment parameters, at a lower running cost than those bulky & nasty generators. 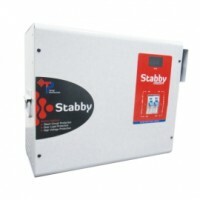 Sophisticated Inverter/UPS: Safeguards your highly sophisticated electronic & electrical equipment. IBM Charging Technology: Intelligent Battery Management improves Power Factor up to 0.9 & cuts down electricity bills. Software Gateway: ASC Technology - Assessing System configuration- It verifies all critical system parameters at the time of start and during the running of the system. time delay of 2.5 mins. One more feather in our wing in the form of PLPO: Peak Load-Peak Output - this special feature is incorporated to ensure smooth running, and solves the problem of cold start and ensure high peak handling capacity. Battery Equalizer: Safeguards batteries & assures optimum utilization for longer life. LCD & LED Panels: In-built LCD & LED panels for continuous information about its status. ECAC Technology: Error Correction Analogue Compare for Low THD - produces electricity just like as your mains supply. Static UPS: Minimizes the chance of rebooting and restarting of sensitive equipments like Computer, DVD Player, Medical Equipments etc. during the changeover period. Range: 2/2.5/3/3.5/5/6/7.5/10/15/20/30/40/50/60/100 KVA DSP / Micro controller based design usi..